At the end of the night, Alex told us that "you're not going to believe this, but I loved the socializing part of dinner" ❤️ He usually doesn't feel that way, but this was a really special experience for him. 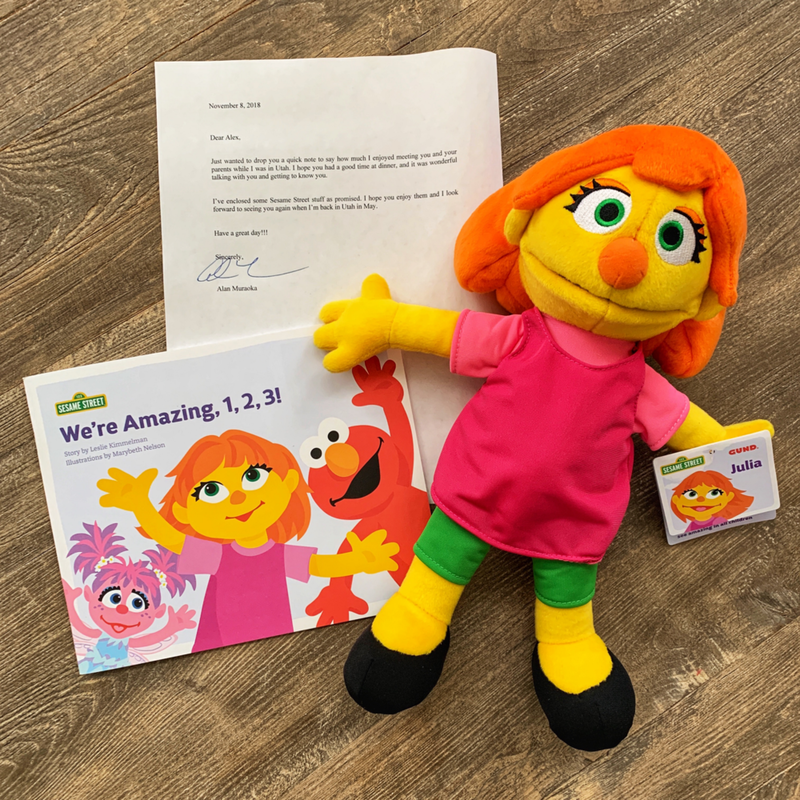 Alan asked if he could send Alex a Julia muppet doll and just a few days later, we received this wonderful package with Julia and a book about her. Alex has autism so it was really neat that he could share his feelings about Julia's role on Sesame Street. 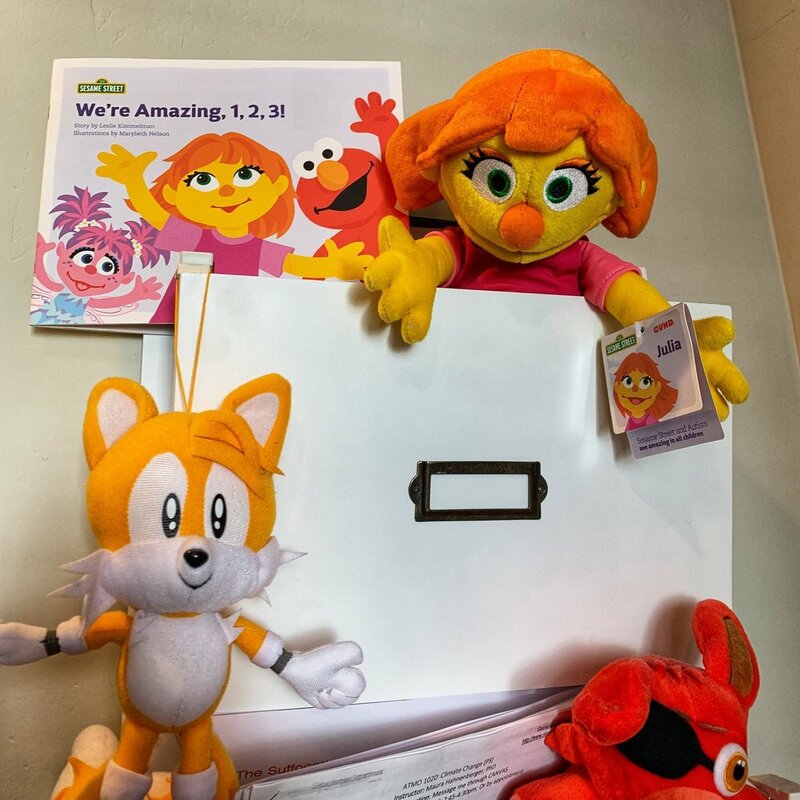 When Alan asked him about his thoughts on Julia, Alex told him that Sesame Street had gotten this right and that he knew they would because they do their research. Julia is going to hang out in our office next to Alex's desk. The book that Alan sent with her does such a good job of portraying a young child with autism in a positive way that other children can understand. Well done Sesame Street! Alan was so kind to all of us and he even sent a Cookie Monster water bottle for me since I told Alan that Cookie Monster is my spirit animal. This bottle will be proudly displayed on my shelf next to my cookie monster toys. I feel a new collection starting! We feel so lucky to have had this great experience. If you’ve ever wondered if Alan is as nice as he seems on Sesame Street, the answer is totally YES! We are thrilled that Mr. Hooper’s store is in his hands.